In the last few days, it has been announced that Phillips is re-entering the hearing aid market with the launch of a new hearing aid range called Hearlink. The range has been introduced in collaboration with Demant (the owners of the Oticon, Bernafon and Sonic hearing aid brands). This isn’t the first time that Phillips has had their name on hearing aids. Quite a long time ago Phillips hearing aids were renowned for quality and reliability. However, they decided to leave the business, what has brought them back, why now and what have they got to offer? Let’s talk Phillips Hearlink hearing aids. Phillips is collaborating with Demant and for the moment, Demant is providing the hardware involved. Anyone familiar with Oticon, Bernafon or indeed Sonic will recognise the hearing aid models and accessories that Phillips are offering. The audiological strategies inside the hearing aids are pretty similar to Bernafon core strategies, at least for the moment. That may change as Phillips gears up their own research and design team. Let’s look at the announcement and then look at the range available. Copenhagen, Denmark, April 10th, 2019 – Demant is pleased to announce the introduction of Philips branded hearing aids to the global hearing aid market. 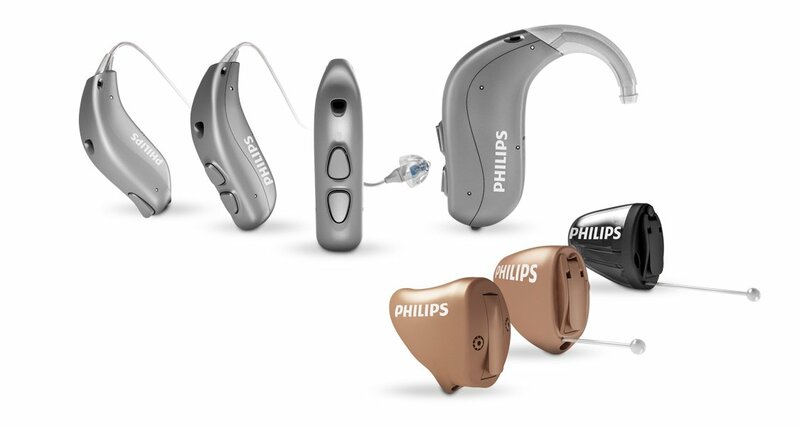 A new player, the Philips brand is entering the hearing healthcare market with a complete range of premium hearing aids, accessories, and applications to best serve hearing aid users. These Philips Hearing Solutions will quickly become a trusted brand with hearing care providers and users, as it has great potential around the world to present unique opportunities for hearing care professionals in an ever-evolving market. “Based on a shared vision of improving the lives of people through innovative healthcare this new cooperation will not only change the way we see hearing healthcare, but also widen the definition of hearing healthcare, supporting healthier lifestyles and active aging,” says Spencer Ramsey, Senior Director, Brand Licensing, Philips. “Combining Demant’s world-leading hearing aid technology with Philips’ global brand presence in healthcare, the cooperation will enrich the hearing healthcare experience”. The new premium Philips hearing aids, named Philips HearLink, are now available for trained and educated hearing care professionals in selected countries across the globe: Philips HearLink will enable users to listen better so that they can better connect with the people they care for. Users will also benefit from connectivity between their hearing aids and the devices they use in their everyday life, such as smartphones and televisions. The look and feel of the Philips HearLink hearing aids caters to today’s baby boomer generation with design and usability developed for this expanding market. “With this partnership, we take connected hearing healthcare to the next level and offer new and exciting solutions within integrated healthcare services to the benefit of both professionals and people suffering from a hearing loss. Health, caring and innovation are cornerstones in the vision of both Demant and Philips, which makes the partnership a great match for the future. Furthermore, it will strengthen and add value to both companies’ ambition to improve people’s lives,” Søren Nielsen concludes. In the context of both the brand, the hearing devices and the market aspirations, what could that mean moving forward? I think there are many possibilities, for instance, leveraging a smartphone the system could be used to undertake a deep analysis of sound situations and changes made by users, ala Widex Machine Learning. The system could also be used to allow deeper manipulation of the function of hearing aids and background data analysis of those manipulations. Hell, the system could be used for self-fitting and fine-tuning moving forward while allowing deep analysis of those protocols If combined with other health data from other Phillips health suit apps it could lead to better understanding of patterns in relation to hearing and wider health. I have said it before, we are only limited by our imagination here, or at least the imagination of the designers. As per the announcement, the new Hearlink range will be available in only a few global markets initially with the UK and USA being two of them. I think that the use of the brand Phillips can help with consumer awareness for the wider market. The theory is that no consumer recognises the brand of the hearing aids they wear. I don’t believe that is the case any longer, in fact, this site and others have worked diligently to ensure that is no longer true over many years. Having said that, Phonak, Oticon or Widex are not exactly household names. Moving forward, it will be interesting to see what Phillips do with the brand and what channels they will decide to use. While Demant has become involved with them in order that the wider consumer recognition strategy can be used. Phillips probably has its own plans in relation to channels. I rather think Demant will find it an interesting ride. For the moment and with the Hearlink range it seems you will need to go to a hearing care professional to try them out. The question is though, will that remain the case? That will be an interesting one. The range is made up of seven hearing aid models at five different technology levels or price points. The devices are three receiver in canal devices, the miniRITE, the miniRITE-T, the miniRITE-TR. One behind the ear device the BTE PP and finally three custom in the ear hearing aids, the IIC, the CIC and the ITC. In a later article, I will give you a full rundown of the hearing aids and their features. The accessories for the devices are exactly as you would expect if you are familiar with Oticon or Bernafon. There are a multi-functional remote mic streamer, a TV streamer and a small remote control. Again, when I am covering the hearing aids I will also detail the accessories. Interesting times ahead I think, it will be fascinating to see what Phillips decides to do over the next couple of years. Self-fitting Hearing Aids / OTC / DIY – How Close are We? Earwax is a problem, people may think they have a hearing loss but actually just have a lot of wax, so they don’t even need an aid. Another problem is that there will be people with a hearing loss so bad that it requires a custom earpiece to be made that is moulded to their ear to avoid feedback, as the sound amplification needed is so powerful. I”m in this bracket, I would not be able to wear an off-the-shelf hearing aid, I’d need something custom made. A further problem would be the time needed for someone to get used to a new hearing aid, this is not a problem specifically for self-fitting purchases as many hearing practices find that many people return their aids quickly, upset that they aren’t hearing as well as they wanted because they have not taken the time to retrain their ears and brains to comprehend the new sounds they are experiencing. People want instant success, plug-and-play but it is often not going to be like that, not because of the hearing aid, but because of your brain – for this reason, there will be returned hearing aids, bad reviews, and upset customers. For me, moving towards a self-fitting model and using a professional for advice and support where needed is not about getting rid of the professional audiologist/dispenser because they are bad in some way or even because self-fitting is better. It’s not about getting rid of the professional for the sake of it, or just because we can. The real benefit to doing this is making it quicker and easier for people to get a real fully-functioning hearing aid and to get major benefits from it, without having to book an appointment, travel across town and so on. But even more than that, having hearing aids for sale in every electronics store normalizes them, they become just another consumer electronic item that someone might pick up with their new TV – hearing aids stop being a medical device for people with medical deficiencies and become a lifestyle accessory that people are happy to wear, even want to wear. Currently, only a tiny percentage of the people who need a hearing aid actually wear one, the barrier to wearing is too high for them, maybe that’s because of the price, the hassle or the stigma of needing a medical device – self-fitting can fix all of these issues and sky-rocket the number of people hearing better. Interesting Purchase, But What Could it Mean For Consumers? In a really interesting turn of events, I found out that Sonova purchased the Australian hearing aid business Blamey And Saunders. Blamey And Saunders are a business that we have discussed here a few times. 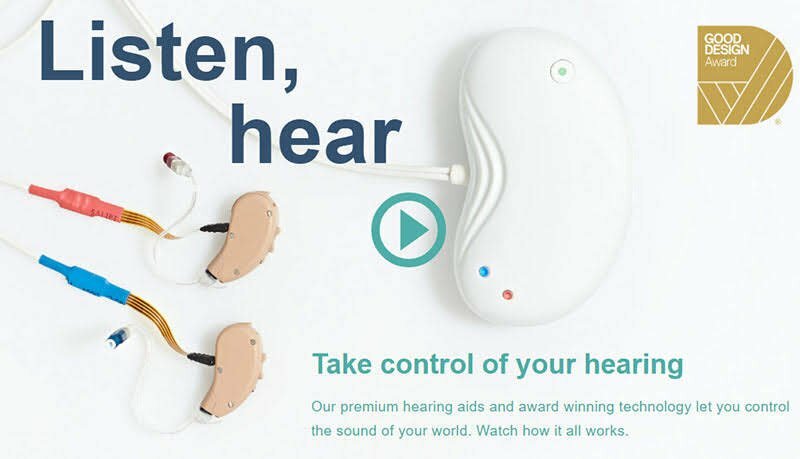 They sell their own brand hearing aids online in Australia and they are one of the few online hearing aid sellers that we would be happy to support. They have designed and manufactured both their own hearing aids and the underlying logistics to support a direct online sale. There have been persistent rumours that they were finding it difficult to reach profitability, mainly because of the economy of scales and the fact that their manufacturing was undertaken in Australia. So why is the purchase important to Consumers and what might it mean moving forward? Blamey And Saunders quickly realised that not everyone is confident enough to buy a hearing aid online. It quickly became obvious that to maximise sales and take care of customers they needed to look at a blended model of online sales and physical locations for offline sales and service. They launched their blended model a couple of years ago but haven’t expanded past three physical locations in Melbourne, Brisbane and Sydney. They do however offer a limited travelling clinic service across some areas in Queensland, Western Australia, Victoria, South Australia, Tasmania and the Australian Capital Territory. The Sonova purchase will mean that there should be an instant change to the economy of scale issue. 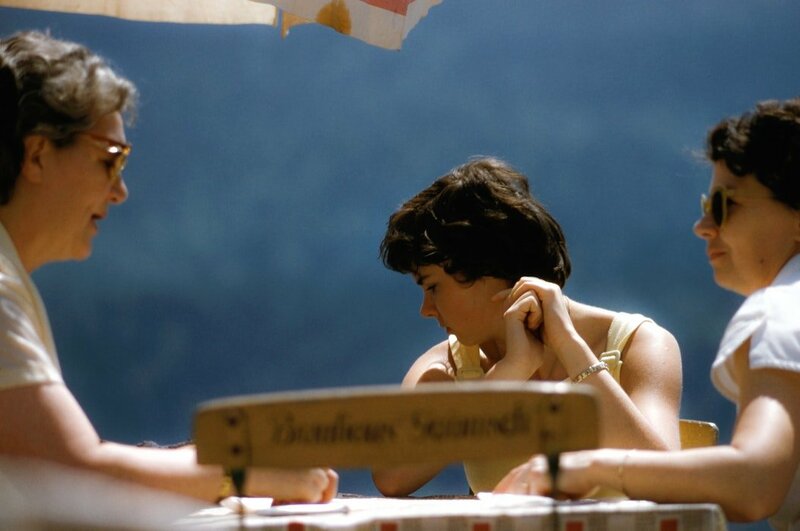 It should mean that the business should more easily reach profitability. The might of Sonova should also mean that the business may see more penetration into the Australian market, maybe widening it’s physical footprint and possibly even looking further afield for new markets. Why Might it Matter to You? Yes, I can hear it from here, hey fat lad, why would I care? Well, that’s an interesting one, to be honest with you. The purchase of Blamey And Saunders is more than just the purchase of that company, it is the purchase of a whole new delivery channel and the experience that is inherent within the business. It gives them an in-depth insight into how a DTC (Direct To Consumer) model works in an online manner. It also gives them a clear experience of how a blended (both online and offline) model works. How you buy hearing aids is without a doubt going to change within the next five years. How it will change is not set though. Over The Counter, (OTC) hearing aids can be expected within the next year or so. If the big hearing aid brands become involved with that, we will probably see some sort of blended model offer. You can buy your OTC device online or at a shop knowing that there may be further services such as in-depth hearing testing, upgrades of devices and ongoing care available at hearing aid outlets. That model may well lead to a situation where we may see all hearing aids being sold directly to the consumer with the option of physical locations to offer service and care. The purchase of Blamey And Saunders allows Sonova to understand the possibilities of this model implicitly. For many consumers, online delivery with blended options is attractive. How attractive is the question though? New users or prospects tend to think very differently to existing users. New users have no terms of reference or experience, that forms their view of price, product and service. Experienced users, on the other hand, have experience and that changes the equation for them. While price is always an issue, it is easier to understand when value for money enters the equation. The problem within the audiology profession has always been their lack of focus on the value for money that they provide. A blended model where device purchase is separated from ongoing service means that the value of the service is clear to the consumer. The key with these business model changes is that they give you, the consumer, choice. I think that for many years, that has been a real bugbear for consumers. They feel the current model is rigid and doesn’t necessarily provide choice. I think the real question for me is how many of you would like to be able to buy a hearing aid online, knowing that you can engage with a physical service location if need be for an added fee? Every day, from the 6th to the 12th, tell one person about your hearing loss. This could be a positive mention, “Even though I wear hearing aids I heard everything you just said perfectly”, or, “Thanks for repeating yourself, I heard you clearly”. Or something more negative, “I’ve had a rough day, I couldn’t hear what the train announcer was saying and didn’t know which platform I should be on”. The point is this: get into the habit of telling people about your hearing issues, just drop it into a conversation where you can, you don’t need to bore someone to death with it but just bring it up, get it into the open. Well, of course, there are benefits for you: the more people around you who know about your hearing loss the easier our life becomes. But I’m thinking of the bigger picture and during Deaf Awareness Week I think it is your duty to tell the world about your hearing loss so that more people become aware of it, become more accepting of it, know how to deal with it and, eventually, it becomes a non-issue like sight problems and wearing glasses. Let’s help all those people struggling to accept their hearing loss, the people hiding their hearing aids, those laughing when they didn’t hear and hoping for the best. Each and everyone one of us can do our little bit to make hearing loss an everyday issue that is widely accepted and understood. I think it’s up to us, the people with hearing loss, the hearing aid wearers, to show the world it’s totally fine, something we deal with while we go about our day and not something we shy away from or are embarrassed about. Attitudes towards hearing aids have already shifted a lot in the last 20 years, sleeker/smaller/cooler aids have helped with that and manufacturers are also starting to market them as everyday accessories and not medical devices as such, all that helps. If we treat our own hearing problems as one-of-those-things, don’t show any embarrassment and don’t apologize for it we can make hearing aids as cool and accepted as glasses. Try it, you’ll probably quickly notice your own attitude to your hearing loss changing, you’ll soon realize that people don’t judge you for not hearing and are perfectly understanding of it. You’ll ditch your own negative views about your hearing problems, so you’ll be more happy to tell people when you can’t hear, making your life easier. It’s a win for you and a win for everyone else. What Are The Pros and Cons of Micro-Suction Ear Wax Removal? Following on from the recent question we had “Is Micro-Suction Ear Wax Removal Safe”, I decided to do a deeper article on the pros and cons of the procedure. In general, micro-suction ear wax removal is a safe procedure, however, like all medical procedures, there can be unintended problems. So let’s take a look at the process and what you really need to know. Why is micro-suction so popular? Micro-suction as a tool for ear wax removal has been around for a very long time. Generally, most ENT departments used micro-suction to remove ear wax from the ear canals of people with perforations or large cavities after mastoid operations. The reason was simple, removal of ear wax using water could be dangerous for these people. Hearing care professionals began to provide ear wax removal as a service several years ago in the UK because it was becoming more difficult to have a GP ( General Practitioner, Medical Doctor) provide the service. GPs are under pressure and ear wax removal takes time. Initially most UK and Irish based hearing care professionals provided ear wax removal with irrigation. However, a few micro-suction courses were set up and as people became certified, more and more professionals offered it. It seems to have taken off in the minds of consumers and most have heard about it and will request it. What are the pros of micro-suction? Although micro-suction can be undertaken without the use of cerumenolytics (ear wax removal drops or sprays), it really appears that it is a good idea to use them for a few days before you have the procedure. All the evidence and my own personal experience appears to show that it will make the procedure far easier for you. On that point, always try to buy a cerumenolytic that comes in a spray bottle. It just makes it easier for you to apply and be confident that it will coat the ear wax and be absorbed. What are the cons of micro-suction? Let’s take a look at them individually, first up, damage to the ear canal and perforation of the eardrum. Generally speaking, there are two ways that damage to the ear canal or eardrum can happen. The first is if you move suddenly and the canula jabs into you. We take exceptional care to ensure that we brace our hand while the cannula is anywhere near your ear canal. The bracing is designed to ensure that if you move suddenly, we maintain control of the cannula and it is pulled out of your ear canal. With that in mind, there shouldn’t be a problem, however, it could happen. Sometimes if we remove a very dry piece of wax off the ear canal it can take a small piece of skin with it. When this happens you will feel a bit of a pinch and there will be a graze left in the ear canal. After the initial pinch, there shouldn’t be any more discomfort. There may well be some bleeding, but there shouldn’t be a huge amount. There shouldn’t be a large amount of blood in the ear canal after an event like this. Generally, if this happens the hearing care professional will use a spray of oil to coat the ear canal and protect the graze. There is a chance that the graze can become infected but it seems to be exceptionally rare. As I said, the procedure is a noisy one, it’s actually not the noise of the machine as such, it is in fact, the noise of the suction in the ear canal. If you are exposed to noise for a period of time, you may suffer a temporary shift in your ability to hear. It seems from the limited studies that this is rare, but, that’s not to say it could not happen.If it does, it should be temporary and will go away within a day or two. The noise is also the culprit when it comes to tinnitus. Think about when you walked out of a disco or a really loud concert and you heard ringing in your ears. The same thing can happen with the noise caused by micro-suction. Again, it should be temporary and should fade within a few days. If you have existing tinnitus, micro-suction could make it worse. Again, it should be temporary, but if your tinnitus causes you real problems, well then perhaps micro-suction isn’t for you. If micro-suction is done for long enough, the procedure can cool the temperature in your ear canal. That will make you dizzy. Generally, the hearing care professional will try to keep the amount of time the canula is in your ear to a minimum. Again, this is a rare event, but it can happen. How dangerous is micro-suction ear wax removal really? Recently we have received a few questions about the safety of micro-suction for ear wax removal. I think this is because the procedure is so prevalent. To respond to the questions I did some research into medical studies undertaken around micro-suction ear wax removal. Unfortunately, there are very few in existence. In the study Aural microsuction for wax impaction: survey of efficacy and patient perception a study that was undertaken with 159 patients. It was found that although a few people suffered from some pain and or vertigo, “Aural microsuction is well tolerated. Side effects are mild, and the prior use of cerumenolytics appears to further reduce their severity”. That is really the only live study involving Patients I could find. One of the things that some people have mentioned is the onset of tinnitus and even the onset of permanent hearing loss where there was none before as a result of micro-suction ear wax removal. There is very little evidence out there that supports the claims. I don’t doubt the veracity of the people who make those claims, but looking at the studies and searching the journals and internet they are exceptionally rare events. So rare in fact that there is no mentions in medical journals. In general, ear wax removal by micro-suction is a safe procedure, however, as I said, with any medical procedure, there are things that may go wrong. At the recent Livio AI launch I had a chance to speak to Achin Bhowmik PHD, who is the Chief Technology Officer and Executive Vice President of Engineering in Starkey. He is at least partially responsible for the dramatic new focus of the Livio AI hearing aids and their widening function. You can listen to the podcast below. I warn you, the audio isn’t great but it was recorded on the move. I really hate trite marketing tag lines, then one comes along that’s quite true. Like the famous “Layers of Sound” incident with Resound and their Quattro (actually perfect description for their sound) “Welcome To The Revolution” is exceptionally fitting for the Livio AI. Because that is what it represents, a true revolution in functionality in hearing aids. For the first time ever we have a hearing aid with built-in sensors, health tracking, fall detection and it translates 27 languages in real time. That’s pretty revolutionary. 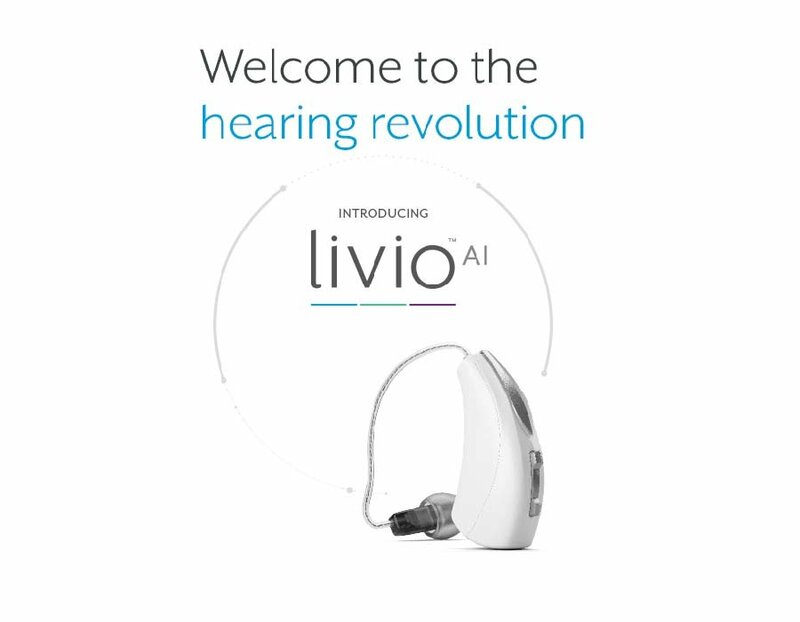 I attended the launch of the new Livio AI hearing aid on the 20th of March in London. The device has been a long time coming and the outline of the functionality has excited a lot of people, me included. I believe the device represents a huge move forward within hearing aids. While I have heard a few people say that the wider functionality is just ancillary, I don’t agree. I think the features are core to the devices and the users that they are designed for. Let’s talk about the devices. I have heard it said several times that sound quality is the true core focus of hearing aids, and that, of course, is true. Up to recently, Starkey really wasn’t famous for sound quality, although that changed slightly with the launch of the Muse. Starkey says that the Livio AI represents their very best sound quality yet and they have introduced some new sound processing features to drive that. Starkey is using binaural communication between two Livio AI hearing aids to produce a more natural sound, preserve the natural sound cues and to drive a better experience in noisy situations. That communication also allows them to preserve inter-aural level differences which will allow you to better localise sound. That in itself should help you to separate speech and noise a little better in noisy situations. I had a brief listen to them through headphones and they sounded pretty good. It wasn’t a true experience by any means, but with the limited, slightly artificial setup, they sounded okay. Starkey says that the new system will deliver a 10% reduction in cognitive effort in noisy environments and a pretty astonishing 80% reduction of noise. That was a little unclear and we didn’t have an opportunity to ask questions. As more info becomes available I will update the article to explain what the figures meant. They have introduced a new system to handle transient or impact noises. The system identifies and reduces those noises quickly which means a slamming door or dropped cutlery on a tile floor will not be as irritating. The Starkey Livio AI hearing aids are Bluetooth hearing aids, audio streaming and streaming of phone calls is limited to the iPhone at present. There was no mention of any plans to deliver Made For Android functionality. I am also unsure of how much of the functionality will work with Android phones. I would take it as said that if you want to get the very best out of these aids you need to be packing an iPhone. I think each of these features is probably worth an article of it’s own, but let’s run through them and why I think they make complete sense. Translation in 27 languages seems perhaps a little strange, but when you consider that older adults are exceptionally likely to travel it starts to make sense. Starkey says that one of the core beliefs they have is that they enable communication, with live translation of different languages, they are doing that. The Livio AI offers relatively decent health monitoring opportunities, while it monitors activity and now heart rate, it also monitors socialisation and how much time is spent engaging with people. The Thrive App uses all of this to give it’s scores. The health monitoring element of the Livio AI is offered via the Thrive App. It offers two measurements that both deliver the possibility of a score of 100 points. It focuses on a Body score and a Brain score. The body score is calculated through a combination of activity, steps and overall movement. This information is tracked daily and accessed easily in the Thrive app. As I said, a daily score of 100 points is possible. 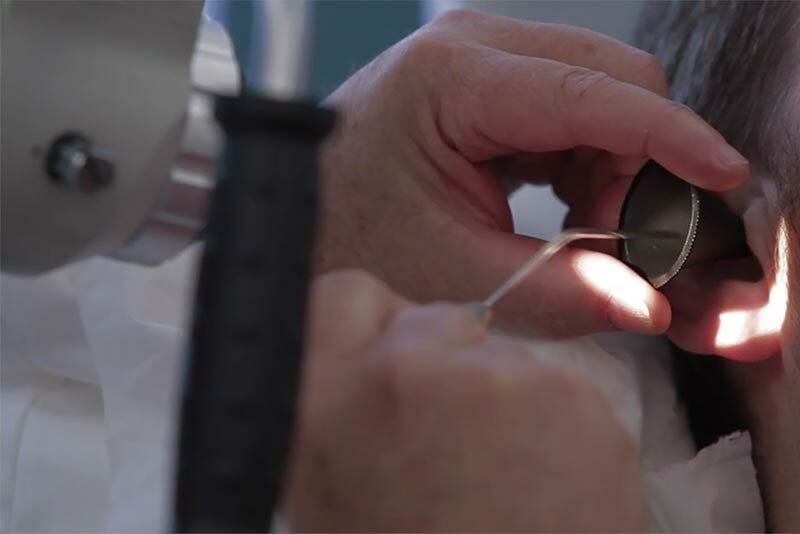 Starkey says that because of the important connection between cognitive health and hearing health, Livio AI measures the brain benefits of wearing hearing aids. I still think that’s marketing fluff, however, I have said before, I do believe there is some validity to what they are doing. The metrics used to measure the Brain score include hours of daily use, social engagement and the tracking of active listening. Again the daily score of 100 points is possible. Does it really give you a score based on cognitive health? No, it doesn’t, however, it gives you a clear idea about some of the things that we know promote good cognitive health and I think that is a good thing. The idea of the Thrive Health Score is gamification of health, basically, in the same way, the Fitbit or any other healthable does. Your daily scores act as a dare to do better and a beratement that you haven’t. As we get older, it is important that we exercise, whether that be focused exercise like gym work or running, or unfocused exercise like nice long walks. Because there is a huge link between hearing loss and a lot of other co-morbidities like heart disease or diabetes. Enabling health tracking in a hearing aid makes perfect sense, I mean you wear them all day, so they are the ideal device to monitor activity. 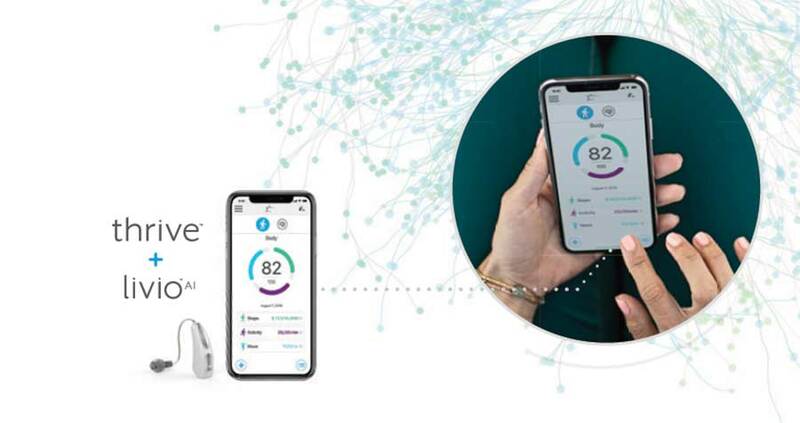 Starkey is leveraging the sensors in the Livio AI to detect falls and they have set up a system in the Thrive App that allows an alert to go out to up to three different designated contacts. I honestly think that this is a stroke of genius, I have said for many years that hearing aids could be the ideal platform for the monitoring of activity and health of older people, ensuring that they can lead independent lives for longer. This system represents a big part of that concept. Older people fall down with alarming regularity and injure themselves, some of them die. The horrible thing is that some who die may have lived if help was quick enough to get to them. That’s a hard pill to swallow, and I would imagine it would lead to great torture for a family. The fall detection and alert system mean that if a Livio AI user falls, their loved ones should know about it instantaneously. I think that represents huge peace of mind. I am telling you, these people are reading my email, I bemoaned the fact several years ago that many hearing aids could be forced to do a self-check of function. I asked why on earth this hadn’t been made available to users in the day of Bluetooth connected hearing aids. Starkey was obviously thinking the same thing, they offer a self-check in the Thrive app which will run a subroutine to check your hearing aids. It’s a handy tool that allows you to be sure if you need to see your professional or the receiver is just blocked with wax. Now you are talking, I always wanted my hearing aids to be my personal assistant, mainly because I have a shocking memory for daily life. Appointments, there was an appointment? Emails, oh yes I kind of remember now ish. Yes, that pretty much sums me up, so I live for the day that I have a personal assistant to just manage that. Because my hearing aids are in my ears all day, it makes sense for them to be the primary point of contact for that stuff. The Thrive Personal Assistant isn’t quite there yet, but after talking to Achin Bhowmik, who is the Chief Technology Officer and Executive Vice President of Engineering for Starkey, I can see that it may well be in the future. You activate the Thrive Personal Assistant with a tap on the hearing aids and then simply speak your query. At present, the Thrive Personal Assistant handles queries in two ways. The AI in the app decides if your query is hearing aid related or a wider general query. If it is hearing aid related such as how do I turn the volume up, the query is handled locally within the app. If it is a wider query, like why is the sky blue?, the app passes it on to Google to answer. That makes perfect sense, Google, Amazon and Apple have spent ridiculous amounts of money on Artificial Intelligence, why the hell does Starkey need to re-invent the wheel? I had a really interesting conversation with Achin Bhowmik, I even managed not to bow from the waist and give it the old Wayne’s World we’re not worthy! He had some pretty fascinating things to say about the future of machine learning and AI in hearing aids and some more interesting things to say about new features that will be coming sooner rather than later. I shall cover that conversation in another article and probably a podcast. 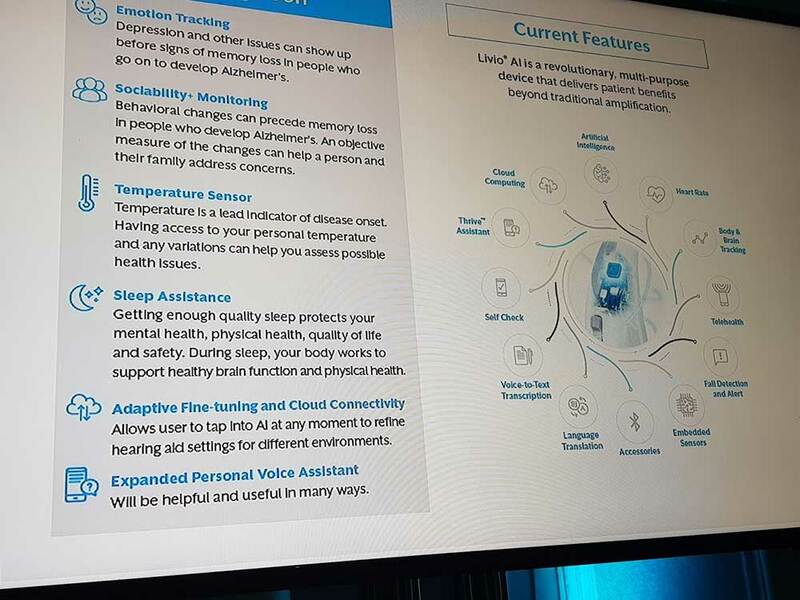 While the presentation on the day was about existing features, Starkey also gave us a glimpse of future features they expected to introduce. While the slide covered pretty much everything that was said, including the expanded function for the Personal Assistant that I was hoping for, it didn’t mention something that was mentioned by Bill Austin during his closing address. He mentioned a facial recognition system which would help with voice prompts. If they are going to introduce something like that well then they are going to have to put cameras on the aids. Now that would be fascinating. Like I said at the start, I heard some people say that these features or abilities aren’t core, I beg to differ. I think they are as core to the design of modern hearing aids as Bluetooth radios are. Moving forward, consumers will expect this type of functionality because it makes sense. Another thing I heard was, well all of these things have been around for a while and Starkey are just taking advantage of them. My reply was yup, they had the foresight and design thinking to do just that. Steve Jobs didn’t invent anything, he just took lot’s of existing technology and features and re-packaged them. The point is that he was the man with the vision to do so, just as Starkey have had the vision to do this. I am no big fan of Starkey, no more than I am a big fan of any particular hearing aid brand, but you have to recognise revolutionary thinking when you see it. Welcome to the revolution, and if the sound quality lives up to the claims, it will be a revolution.